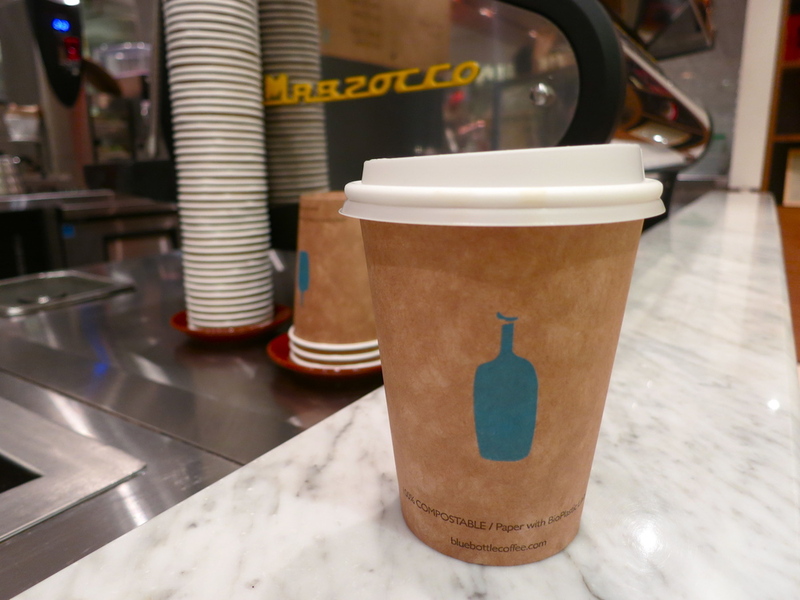 Blue Bottle Coffee is one of the premium coffee roasters nationwide, and so I was lucky enough to visit one of their outposts in the Rockefeller Plaza. The interior is very modern and simple. The only sense of color is the blue logo that can be found on just about everything. The one in the Rockefeller doesn't have any seats, but outside of the café, there are tables and chairs. It would be a good spot to stop by after some shopping, or as a palate cap after a meal. The other locations are about 50/50 in terms of seating, so it's not necessarily a place you want to set up a meeting or grab a coffee with a friend. It's the perfect place to go in the morning for a good cup of coffee and maybe a pastry, and then get going. I ordered a Sidamo Howolso, which the barista made right in front of me. It was very flavorful and fruity, with hints of violet, hibiscus, and even canteloupe. It's so flavorful on its own that it doesn't need anything else to go with it. The barista was explaining the process of brewing the coffee to me with such passion, that I couldn't help but be sucked in to the art of coffee making in that moment. Blue Bottle keeps things simple, so their spots are good places to go if you don't feel like dealing with the hustle and bustle of more elaborate cafés.